Happy Halloween! It's kinda funny I'm here blogging about Farmhouse Style Decor on such a fun Holiday but hey, it is what it is, right? Ha! If you haven't had time to catch up, I started a new series on my blog three weeks ago about my transition to farmhouse style and ways you can transition too! You can check out the previous weeks here! One of the things I get asked a TON on instagram is, "Where do you shop for all of your decor?" 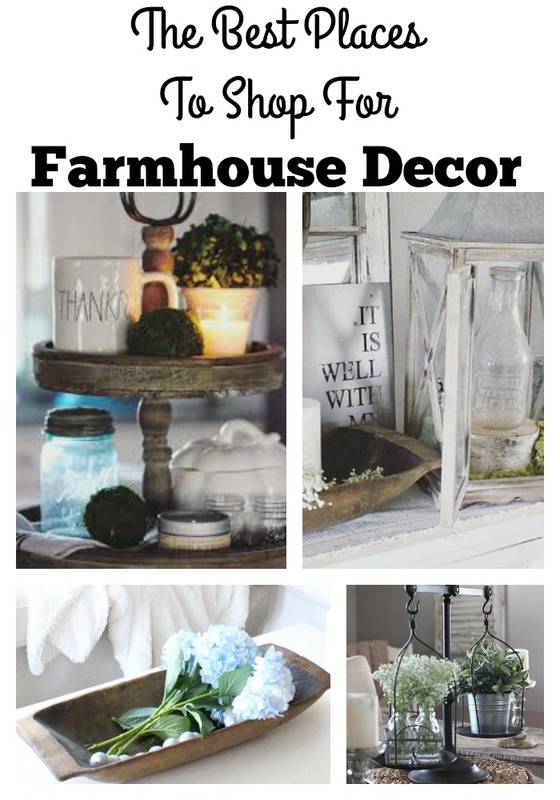 Lots of things in my home have been gifted, or picked up at antique shops, HOWEVER, a good amount of things in my home have been purchased and today I'm going to share with you 5 of my favorite places to shop for Farmhouse Decor ONLINE. I really do love to browse Home Goods or Etsy for unique farmhouse style finds, however, etsy can sometimes have costly shipping and Home Goods can be hit or miss. The following shops are always full of farmhouse goodies, and you're sure to find something (or several things!) you love in these shops! 1. Painted Fox Home- they have one of the best farmhouse selections and pretty much anything you could want for a farmhouse home! I especially love their gorgeous dough bowl! I blogged all about how you can style dough bowls here. 2. Shady Oaks Farm- This is one of my favorite shops, the sweet ladies behind it are so helpful and are always open and willing to answer any of your questions! My favorite things in this shop full of goodies are the farmhouse trays! They have a HUGE selection and are reasonably priced. This is a great place to start home decor shopping if you want to farmhouse up your home. 3. Decor Steals- Decor Steals is a flashsale site, offering new deals at insanely low prices daily! They offer so many unique items and I've been able to get so many gorgeous things there at great prices, even better is the low cost shipping! Sign up for deals and you'll unlock a special steal when you check out. The shipping sometimes takes a few weeks but it's always worth it! 4. Antique Farmhouse- I absolutely LOVE this shop! I've snagged some many unique and amazing things at great deals! Similar to Decor Steals, new flash sales are posted daily, but instead of just one item, it's collections. Often times full of unique and vintage inspired or authentic vintage items. Also like Decor Steals, shipping can sometimes take a little longer then usual but the low prices make it worth it! You will find the LOWEST prices on your favorite items in this little online shop! 5. Antique Candle Works- I know that candles aren't exactly farmhouse decor, but I just love these amazing candles! They are my absolute favorite and the shop owner is a doll, these are hand poured candles and they come in the most amazing scents, ever! No farmhouse is complete in my opinion, without a yummy smelly candle burning. There is just something so cozy about it! So there you have it friends! 5 of my favorite places to shop for Farmhouse Style Decor! Also, don't be scared to search places like Amazon and Target! I've found some amazing deals on some of my favorite decor at those places. So where are some of your favorite places to shop for Home Decor? I'd love to hear from you! Feel free to chat with me on instagram or facebook! I just love hearing from you guys!! I haven't heard of most of those shops! Gotta love online shopping!! I LOVE the style of the table and chairs. Does it say anywhere who originally made it? I've been looking for something just it for my 2 little ones. Most of these websites are WAY over priced on their farmhouse décor. Do you know of any sites that are actually good deals?